British Farmers are reportedly losing an average of £21 a pig at the moment so last week the British Pig Association led a rally to present a giant sausage to Downing Street. I’m not sure exactly what the government were expected to do about it. It might have been a good time to open serious debate about pigswill, because in my opinion until we start treating consumers as adults who can understand the issues farmers face, I don’t think we stand much chance of persuading them to spend more of their already strained food budget on higher production standards. However, my place is to talk about food culture, and whilst the above comment shows how far we still have to go in developing this in the UK, what can be said is that we love our sausages and presenting pork in this form is a good way for farmers to add value to their basic product. The single most important lesson we learnt was that a reasonable level of fat is required to produce a succulent sausage. Health considerations had led most people to choose the leanest meat, but the best results came from those sausages that incorporated a percentage of diced back fat. With the pork we were using on the course, we concluded that equal proportions of shoulder and belly pork gave the best results. Subsequently I have realised that this depends on the fat content of the pig concerned. When I made sausages using traditionally reared Tamworth pigs, this 50/50 mix actually gave too much fat and sausages made entirely with shoulder meat were better. So there will still be a degree of trial and error, but don’t assume lean meat produces the better sausage. Directly related to the above is the question of whether to include any “filler”. We found that including 15% of dry breadcrumbs helped retain some of the fat in the sausage giving a more succulent result than 100% meat. Classic combinations of fresh herbs and spices worked best. They have become classics for a reason and those who had tried to be too inventive were usually disappointed with the results. See here for recipes giving some of the classic regional flavourings. I hope you also noted the adjective fresh in relation to herbs and spices. Most butchers buy ready mixed flavourings to create a range of popular sausages. 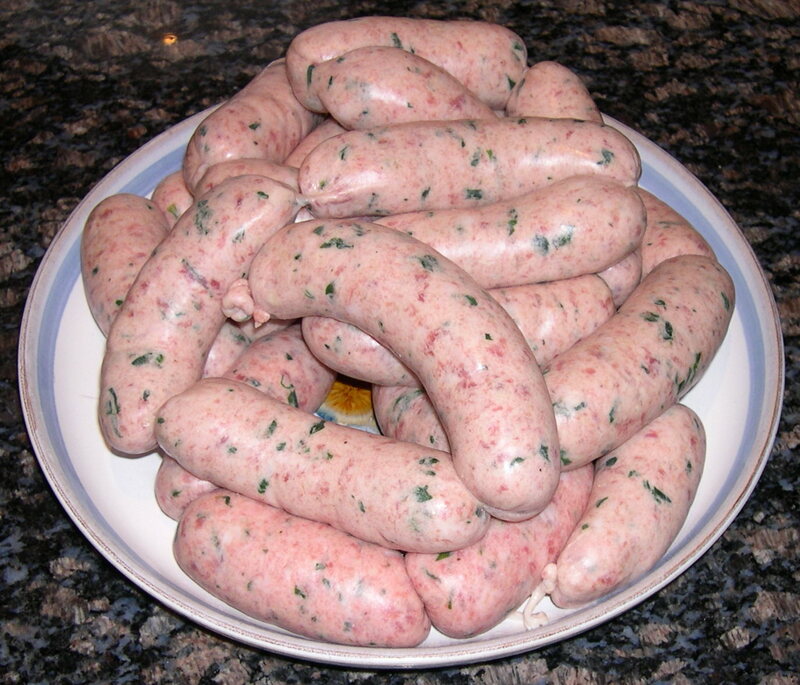 The companies that supply sausage skins usually try to sell these by including a free pack or two with your order. A mere sniff was enough to confirm how musty and unappetising they were. Dried herbs also have a tendency to repeat on the eater. The main reason I know for people making sausages at home is because it is so difficult to buy sausages without preservatives. The reasons for wanting to avoid preservatives vary – one person swears that she can taste them; others are concerned about the link between nitrosamines and cancer. My main gripe is that they are so often incorporated as part of the dreaded pre-mixed flavouring packs – although it is possible to buy the preservatives alone. I can understand why most producers include them. The very name of the potentially lethal toxin Clostridium botulinum, which gives rise to botulism, is derived from the Latin word for sausage, reminding us that they are a common source of food poisoning. There is also the issue of shelf-life. Sausages without preservatives should be used within three days. I have learnt not assume that all frozen sausages are inferior as very often this is the compromise to which producers who do not use preservatives have to resort. Without any chemical additions it is of course paramount that you adhere carefully to sound hygiene practices when making sausages. In particular meat should be kept in the fridge until it is needed as once minced the smaller pieces are already warming providing the ideal conditions in which bacteria breed. The toxins that develop from the presence of Clostridium botulinum are destroyed by temperatures above 160˚F (71˚C) so ensuring the sausages are cooked through is the final important safeguard. Providing you follow these guidelines, there is really no need to use chemical additives. We found that larger sausages remained more succulent than thinner ones, i.e. approximately six sausages to the pound rather than the eight that are frequently found. This may be the time to warn that sausages made in this way are likely to cost around £5 per pound – or almost a pound per sausage. Making them yourself does not usually result in great cost savings, unless you make huge quantities, and it is probably not worth making less than 10lbs of sausages. This entry was posted in Food Culture, March - Articles. Bookmark the permalink.